food, Markets, Portugal, Shopaholic abroad, Transport - planes, trains and automobiles, Travel - bon voyage! Monsieur and I had enjoyed our time in the Funchal fish market, watching the workers carving, stripping and gutting fish of all sizes. 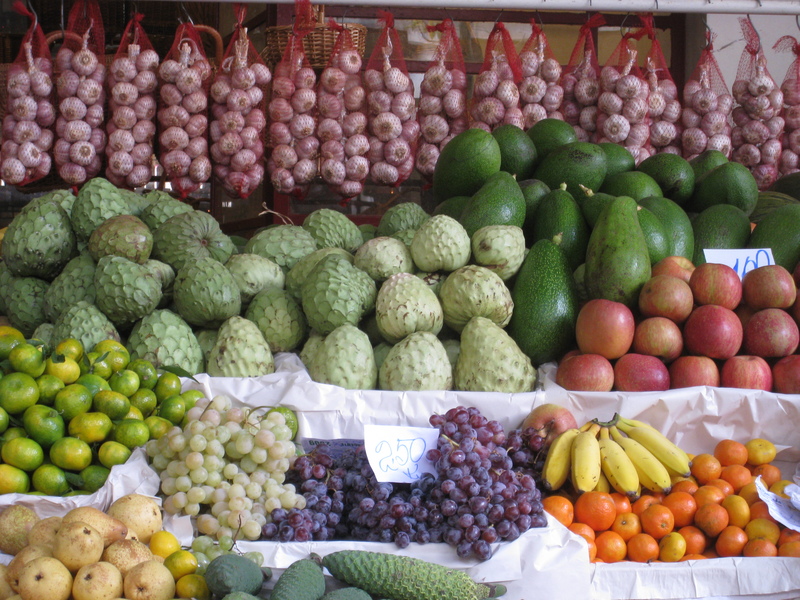 We were now curious to see what Madeiran fruit and vegetables were like. My current header was taken from the above image. 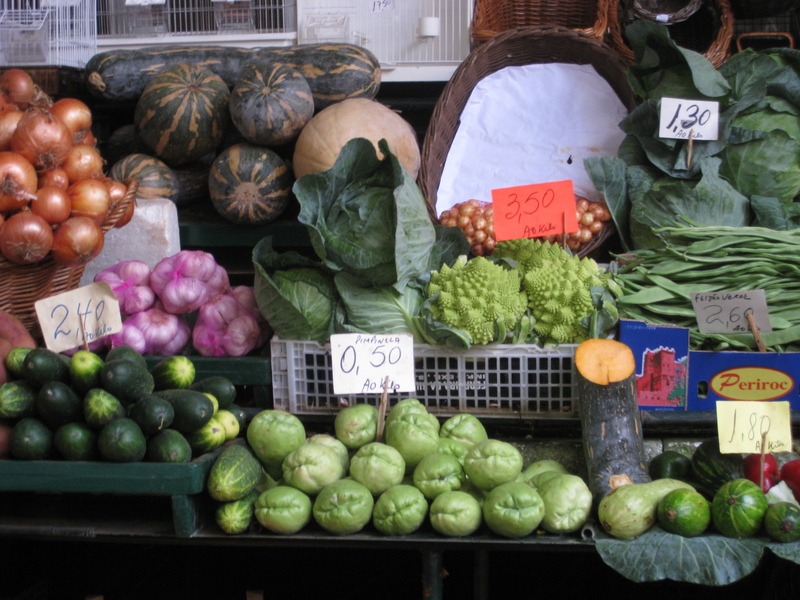 Look at the produce – the bright green avocadoes, the perfect artichokes, the rosy apples, fat grapes, stumpy bananas, happy orange mandarins. Some of these things I’m not sure I can identify – like the squashy-looking green balls next to the courgettes at the bottom of the stall or that prickly green vegetable?/fruit? between the cabbages and the beans. Can you help me, anyone? 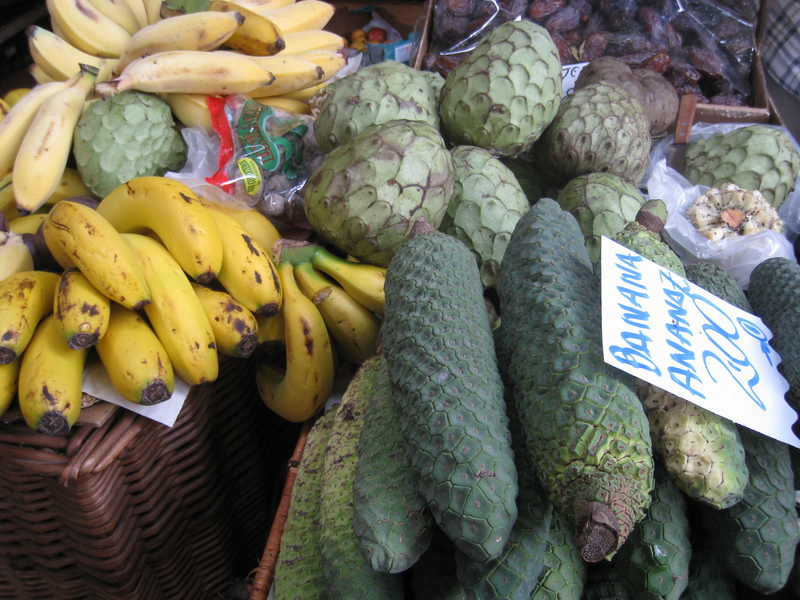 On the right hand side, the long green fruit are Banana-Ananaz, or Banana Pineapple. Also known as the Monstera Deliciosa, it has the tropical flavour of banana, pineapple and mango, and grows happily in Madeira’s sub-tropical climate. 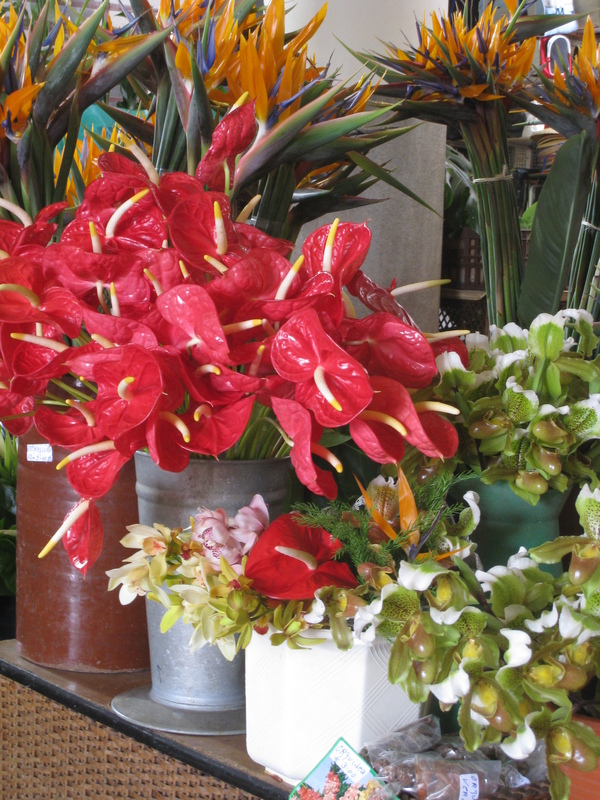 The florist stands were dazzling – loaded up with anthuriums, birds of paradise and orchids. I swear I’d never before seen such massive anthuriums, not even in Hawaii – some flowers were the size of dinner plates! I could have wandered about the market for a long, long time, but it was lunch time and the vendors looked hungry. The stall shutters started coming down, so Monsieur and I took this as a sign to leave in search of our own lunch. That’s the downside of being addicted to markets: they make you hungry. It makes you laugh cos it wasn’t you who was made to eat them :P. To her credit she did give away as many as she could…but it was never enough I thought! Was nice meeting you yesterday. Ann – hysterical! You’ve really made me giggle. Thanks for letting me know. Yes, lovely to catch up with you, too. See you at another LBM soon, I hope! Back again to these vegetables (I must sound obsessed huh?). Have just been watching ‘Come Dine with me’ (yeay to Sat tv while trying to work), and one of the participants is using the vegetable, and called it cho-cho. Looked on wikipedia (as any PhD student should ALWAYS do when faced with a question) and voila! : http://en.wikipedia.org/wiki/Chayote. As much info as you probably ever want to know about the squashy green balls :). Ann – it would seem that with strange vegetable identification, you’re the one to call. Thanks for the link! Hi Bee, thanks for visiting. I have to say that your site makes me hungry. Thank you! I don’t think you could give a food blogger a bigger complement! 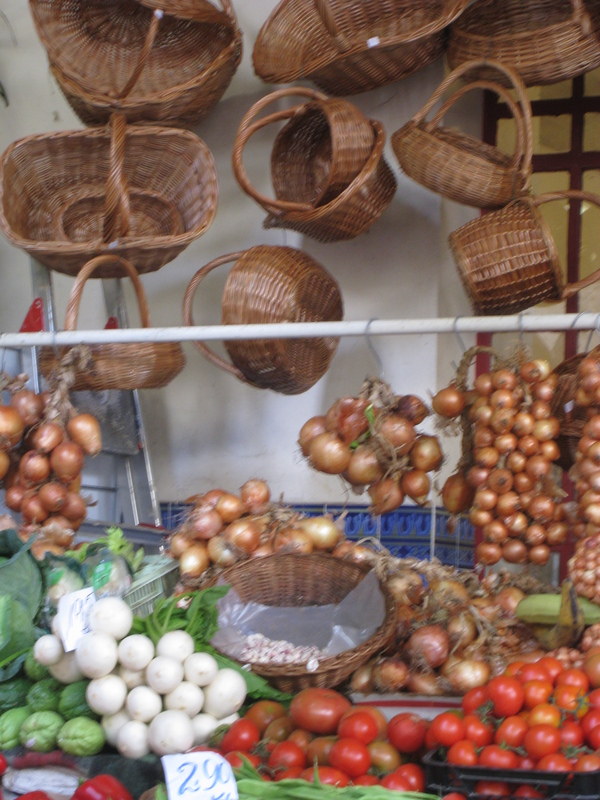 Going to a fruit and veggie market in a different country makes me feel uneducated. I’m not sure if I feel stupid because I don’t know what a certain fruit is … or because I don’t know how to eat it.